Ballard Estate,Mumbai - 400 001. 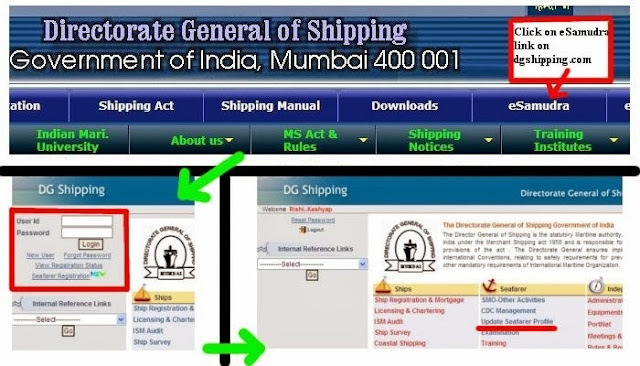 To Renew Indian CDC, following certificates to be sent along with Form B (latest copy) to Mumbai Shipping office. Computer Cell (INDOS)/2010-I dated 09.11.2011. (i)Two passport size photographs (size 3.5 cm x 3.5 cm) in white shirt in addition to the photo affixed on the application form. Photo in uniform is not acceptable. (ii) One self addressed post card. (iii)One self addressed envelope (size 5 " x 12") with Rs.100/- postage stamp affixed (to forward the CDC by speed post). (iv)Non-refundable fee of Rs.1000/- through Demand Draft in favor of Shipping Master, Mumbai payable at Mumbai. (vii) Attested copy of INDOS Certificate. (viii)Attested copies of four basic STCW familiarization courses. (x)Print out copy of registration of profile under Directorate Notice No. 1 Computer Cell (INDOS)/2010-11 dated 09.11.2011. Copy of the profile registration print out under Directorate Notice No. 1 Computer Cell (INDOS)/2010-I dated 09.11.2011. Download the CDC Renewal form @ M.S. Notice 24 of 2012 Dated 04.12.2012 . CDC renewal form is self explanatory. It covers not only CDC Renewal but also duplicate and lost CDC replacement procedure. # No need of attestation by Gazetted Officer, Self attestation accepted on copies of your documents. # Do not forget to write your Full name and date of self attestation. # Use only CAPITAL LETTERS while filling your CDC Renewal form. # Write on top left hand of the envelope (containing documents/CDC renewal form) in BLOCK LETTERS Replacement/Duplicate/Re-validation of CDC as required. # No fees levied for re-validation of CDC (CDC Sticker). # Write your name on the reverse of your photograph. All documents list send by me attached below. Register & complete your e-Samudra seafarer profile. Completing your DG Shipping Seafarer profile, is mandatory as per DG Guidelines. How can one track CDC renewal status once CDC Renewal Form is send ? Around 1.5 to 2 month time it required. WHAT YOU WILL GET IN RETURN IN THE ENVELOP FROM D.G.SHIPPING? Indian CDC contain pages marked "SPACE FOR PASTE OF RENEWAL STICKER" almost at the end of CDC (Page number 29 onwards),please stick your CDC renewal sticker on this page. If I had missed something, please do share your experience/updates about CDC renewal sticker.